Catnic's lintels are giving definition to Beaumont, a stunning Country and Coast Homes development of six large houses in Highcroft, Exeter. The lintels, which support the sharp, unusual shape of the architect-designed buildings, were chosen for their strength, reliability and thermal capabilities. The lintels support the exterior window and door features; special corner lintels support the external over-eaves, while large window openings elegantly contour the shape of each house. 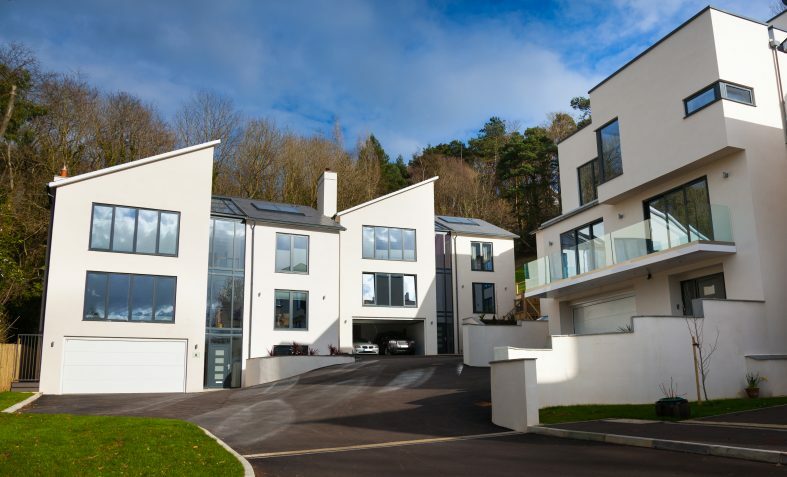 Chosen specifically to support the specialist architectural features of the development, Catnic lintels offer both the structural and thermal performance required for the building envelopes. Approximately 60no. 1.25inch CX cavity lintels were supplied through the Jewson branch in Exeter. Constructed using the traditional brick and block method, the building facades were then finished with a white K-render to all external elevations. Consistent with Country and Coast Homes' portfolio of luxury contemporary homes, the development features superior quality fixtures inside and out. As a brand synonymous with quality in the construction industry, Catnic reflects this too. County and Coast Homes focuses on exceptional attention to detail, it only uses the most reliable and durable products in the construction of its homes. Chris Dodge at County and Coast Homes said: "We have been using Catnic Lintels for over 10 years, they are by far the best. A superbly well organised company who offer exemplary service, their lintels are extremely capable and well suited to our high quality homes." Country and Coast Homes prides itself on a high level of sustainability in each development. Catnic lintels surpassed the energy targets in this particular development by helping deliver the efficiency required to achieve a B on the EPC rating.